All these politicians are such nerds they have no game when it comes to cheating. They should check Berlusconi out. Catch him partying with prostitutes. This 72-year-old cat is like, "I've never paid a woman. I never understood where the satisfaction is when you're missing the pleasure of conquest,"
Ah, I like schadenfreude as much as the next person, but watching Olbermann & Maddow gloating on TV last night I just had to turn the channel. 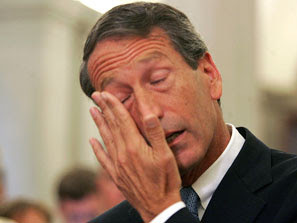 Watching Sanford twist in the wind is just painful. I've heard about the tears but I haven't seen the footage. I was a little annoyed that he apologized to his coy mistress first and then his wife and kids. dayum that must have been some serious pooty! ^ Heh. Enquiring minds want to know, Tanyetta! We'll soon see... and she better be bad. ... watching Olbermann & Maddow gloating on TV last night I just had to turn the channel. Olbermann is King Douchebag. He even dragged Eugene Robinson into his sandbox. Eugene happily went along. Maddow's starting to get on my nerves too. She's at her best when dead serious... rather hard to take when she's trying to be all cutesy-clever. Then I flip over to Fox and they're hardly talking about Sanford at all. O'Reilly didn't even lead with it. I bet Hannity didn't either. I think he was bashing Obama on health care. ^Hey, has Rachel gone downhill or what!? I really used to enjoy her when she was subbing for Olbermann, and when she got her own show I thought it was divine justice. But you're right, the cutesy-smirk thing is really starting to wear on my nerves. Here's the thing. I really don't care if a politician is getting some on the side. I don't think it has much to do with is job (unless he's flying to foreign countries on the taxpayers money). I only find joy in these moments because of the hypocrisy. "I've never paid a woman. I never understood where the satisfaction is when you're missing the pleasure of conquest,"
On THIS, I completely feel Berlusconi. He may be shady and corrupt, but we all have to admit he is a true Mack. I don't think Italy has much of a problem with how he's getting down. I wish the U.S. weren't so up tight.